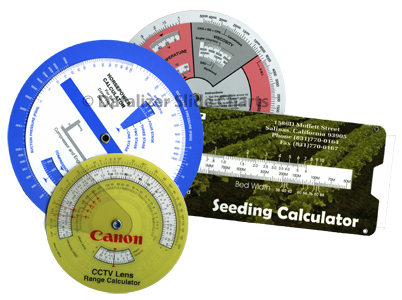 Slide Charts, Slide Rule Style Calculators and Data Reference Wheels are used everyday in industries around the world. To help you research your project, we've provided this list of terms, definitions and keywords. If you are searching for a term not listed here or have other questions, Click here and let us know. We'll get back to you right away. Reference slide rule for gas and oil industries. A Wheel Chart used to calculate healthy body weight based on a person's height. 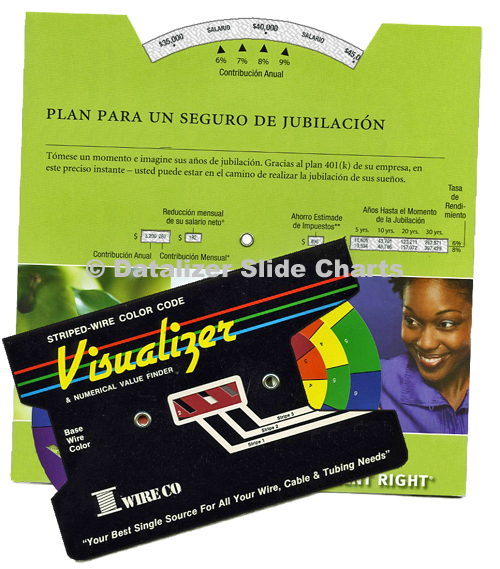 Two or more slide charts hinged together to handle large volumes of data in a smaller slide chart format. United States Copyright Office information sheet regarding computing and measuring devices. Click here to download a copy. Two or more circles, disks or dials connected by a central hub. Dials revolve on the central hub to align slide rule style scales or to reveal hidden data in a die-cut window opening. Slide and Wheel Charts designed to compare products or services and reveal differences. 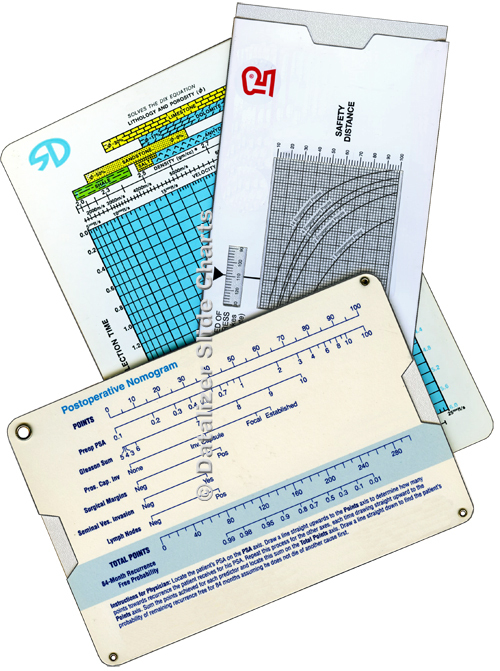 Hand-held Slide and Wheel Charts used to convert from one measuring system to another. 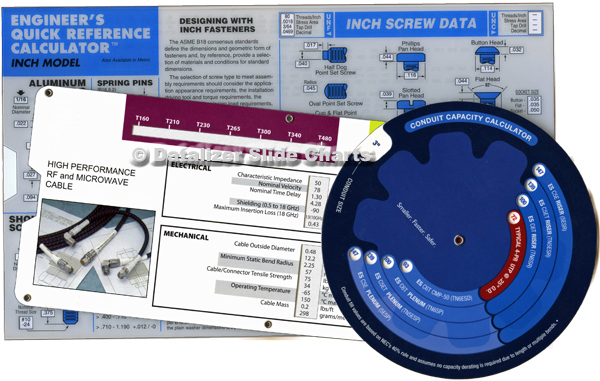 Examples: Metric Converter Slide Charts, Pressure Conversion Calculators, Metric Fastener Converters. Date Finder Wheel Charts for project planning and scheduling. Set a start date, read due dates, delivery dates, actionable dates. Designed to aid medical professionals in administration of drug therapies. 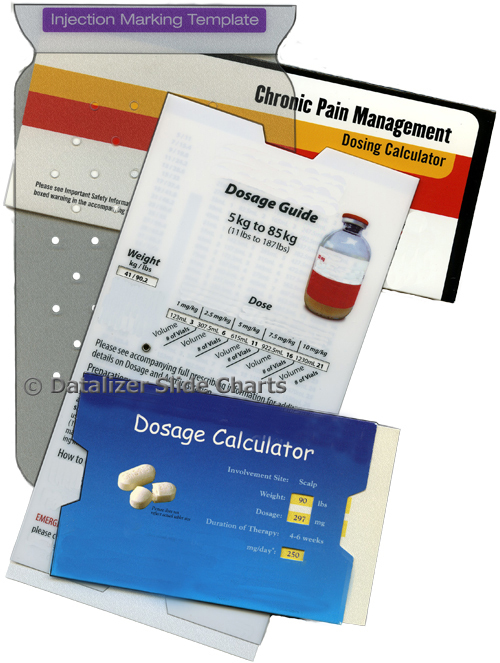 Also known as dosing calculators, dosage charts, dosage slide rules. Slide Charts used by industries involved in fuel extraction, manufacturing, refining, production and sale of energy. Examples: API Flange Slide Rules, Electrical Appliance Operation Cost Calculators, Heating Cost Comparison Slide Rules. Designed to simplify the creative application of technical concepts, products and calculations. Examples: Asphalt & Stone Calculators, Power Speed Calculators, Engineer's Quick Reference Slide Chart, kW-kVA-Amp Calculators, API Gravity/Density Calculators. Designed to communicate info regarding issues and products related to ecology, environment, sustainability. Examples: Carbon Savings Calculators, Water Wheels, Recycling Wheel Charts, Emissions Conversion Slide Guides. A card set grommeted together with a corner eyelet. Cards are rotated around the eyelet to display the data printed on each card. Also know as Card Sets, Swatch Packs and Swatchbooks. A folded outer sleeve, or case, is wrapped around a movable inner slide card. No eyelets are used in this construction style. Can be paperboard or plastic. An instrument for measuring angles. A calibrated medical measuring device for measuring range of motion of joints. Deluxe, all plastic Date Finder Calculator for professional schedulers. Originally sold by Graphic Calculator, Barrington, IL, no longer in business. A similar item is now available from Datalizer. Designed to communicate information regarding issues and products related to ecology, environment, sustainability. Examples: Carbon Savings Calculators, Water Wheels, Recycling Wheels, Emissions Conversion Guides. Designed for the climate control industry. Heating, ventilating & air conditioning. 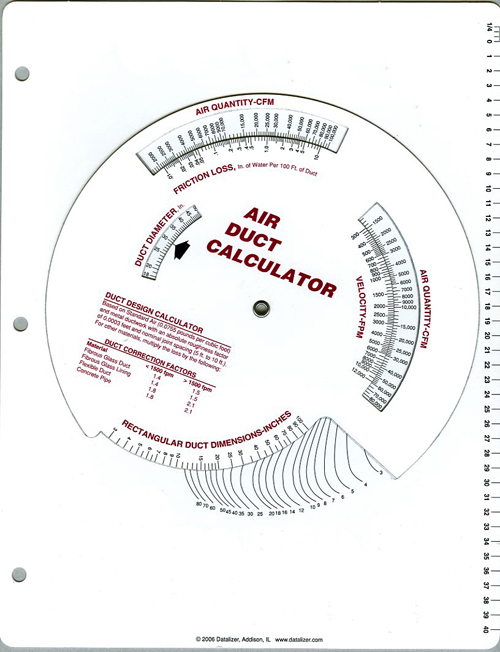 Examples include: Air Velocity Calculator, Gas Pipe Sizing Calculator, Air & Gas Orifice Flow Calculator, Ductulator, Duct Wizard, Duct Design Calculator, Compressor Troubleshooting Guide, Flexible Duct Friction Loss Calculator. Efficient, accurate reference tools designed to present complex calculations for the plumbing industry. Examples include: Friction Loss Calculators, Drainage Pipe Sizing Selectors, Manning's Formula slide rules, Fluid Power Calculators, Hydraulic slide rules, Liquid Flow Calculators. A Slide Rule Style Calculator that uses scales with uniformly spaced divisions, as on a ruler. A Slide Rule Style Calculator that uses the logarithm of a physical quantity instead of the quantity itself. A logarithmic scale is used when data covers a large range of values and reduces it to a more manageable range or size. Slide Rule Style Calculators designed to simplify complex mathematical computations. Examples: Viscosity Conversion Calculators, Payload Slide Rule Style Slide Charts, Metric BMI Slide Rules, Power Distribution Slide Rule Calculators. Designed to meet the exacting requirements of medical and pharmaceutical applications and PhRMA guidelines. Examples: Dosage Calculators, Pregnancy Wheels, GFR Calculators, Medical Trials Schedulers. A graphical calculating chart with three or more mathematical variables. Used to compute a function. A Data Wheel Chart for mapping the positions of the stars. Also known as star charts and night sky maps. Printed on and constructed from plastic materials. Clear and white plastics are used to in a variety of combinations to make slide charts, wheel charts, templates and fan packs. In-store advertising designed to assist customers in self-service purchases. Used to determine probable date of conception and probable delivery date. Also known as due date calculators, gestation wheels, ovulation wheels. A hand-held device, usually of paperboard or plastic, designed to accommodate the organization and calculation of many diverse subjects. A manual computing device similar to a slide rule. Consists of a cover sleeve and an internal slider. 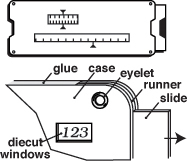 The outer cover is formed into a sleeve open on the ends, through which a slider can be drawn. 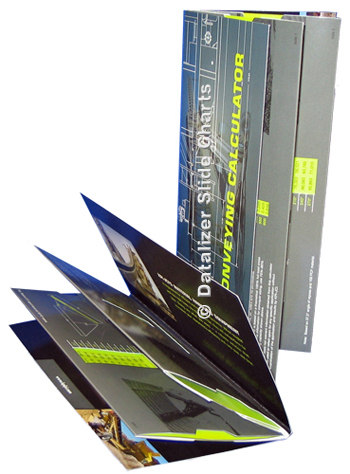 Moving the slider aligns scales for calculations or reveals data in specially die cut opening on the sleeve. 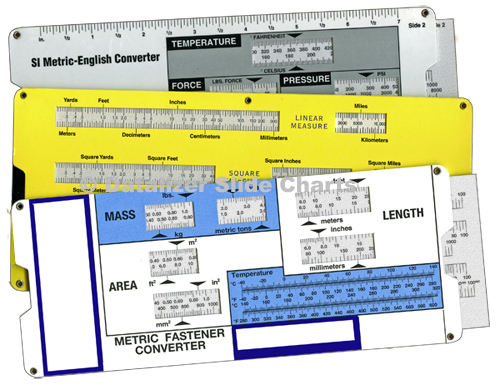 Also known as: Slide Rule Calculator, Slide Calculator, Slide Guide. A manual computing device consisting of two rulers marked with graduated scales, one sliding against the other to perform specific calculations. 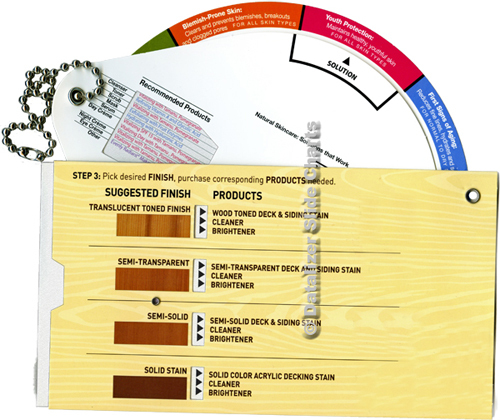 An information card of plastic or paperboard. Slips back and forth inside a cover case/carrier to reveal hidden information or perform calculations. A visual aid that reveals hidden data or images by moving a dial or card with and easy, sliding motion. Cards grommeted together with a corner eyelet. Cards fan out to display information printed on each card. Also know as Fan Packs, Card Sets, Swatch Packs. Notch on the open ends of a slide chart making it easy to grasp and move the inside slider card. 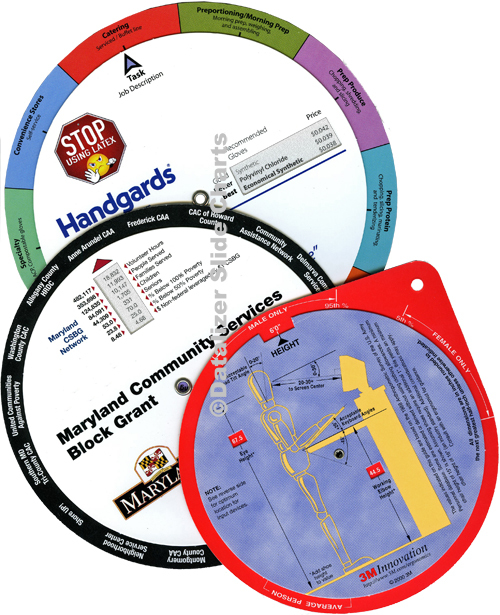 Booklet-style Wheel Chart with a rotating dial enclosed between 2 covers. May also include an additional cover and saddle-stitched insert pages. Also called Data Wheel brochures. 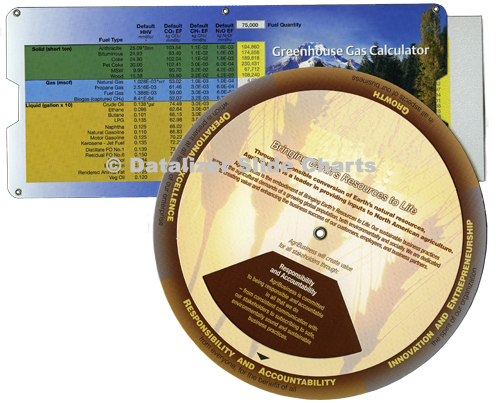 A data wheel chart or slide chart designed to demonstrate a mechanical action. Concentric rotating disks. 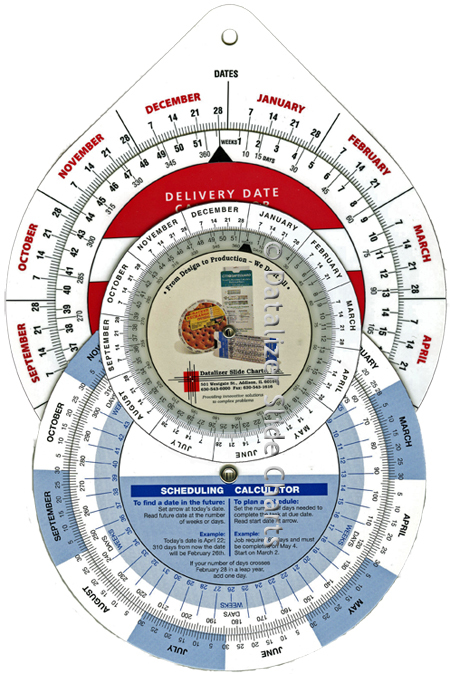 Also known as: Wheel Charts, Circular Slide Rules, Infographic Data Wheels, Trapped Dial Volvelles. Two or more paperboard or plastic circles, connected by a central hub. One dial revolves on the central hub to align graduated scales or to reveal hidden information through a die cut opening. 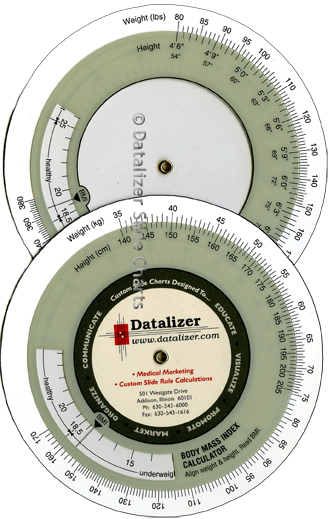 Also known as: circle charts, data dials, data disks, information dials, information discs, printed advertising wheels. A calendar wheel that adjusts for holidays and weekends in the scheduling function. Limited to specific time periods. New version is issued every year.